Nightly Skin Care Routine Checklist! You are here: Home / Great Deals / Nightly Skin Care Routine Checklist! 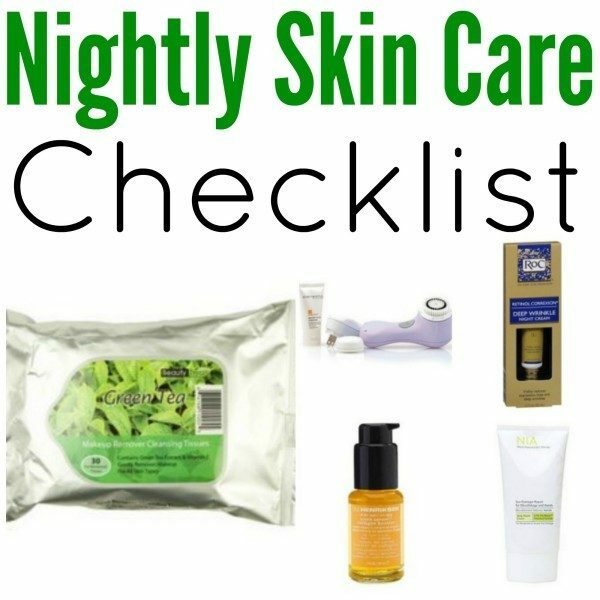 Night Skin Care Routine Checklist! As you age your skin changes. Its important to develop a good skin care routine that will help with problem spots, breakouts, dry skin, under the eyes, pores etc. Check out our Nightly Skin Care Routine Checklist! Before going to bed use wipes to wipe off makeup. Remove makeup, dirt,oil, mascara and anything else that might have accumulated during the day. Beauty Treats Green Tea smell great but they have all sorts of flavors. Find your favorite below. Especially if you wear a lot of makeup, the Clarisonic brush can get deep into your pores. Use the sensitive head to get a deep clean that is not hard or abrasive and does not hurt your skin. For dry skin use a more delicate cleanser with your Clarisonic brush. The DermaQuest delicate skin cleanser for example. Put a little bit on the brush and lightly scrub your face. Afterwards take a wash cloth, wet with warm water and then just clean off your face. Now that your face is clean use straight Retinol cream. Note – please consult your dermatologist for the right prescription. Start with a small dosage (0.05%) as it can cause peeling on your skin. Apply a light layer to targeted areas such as cheeks, chin or forehead for smoother skin. If your skin is dry, use a serum like Ole Henriksen. It has vitamin C and other great nutrients for your skin and smells of oranges and its not too oily. Put a little bit on your hands, rub it together and gently pat it on your skin wherever it’s dry. Forehead, neck, etc. After you have applied your serum, use a moisturizer like Nia24. It has a skin strengthening complex. This has niacin in it and it and does not cause breakouts. It hydrates your skin without leaving it oily. Add a little bit of it and put all over your face and just kind of rub it in. The final step for your skin care routine is the eye cream if needed. Use it when the areas under your eyes get dry. Especially as we age, this area tends to lose the moisture, circles develop. Something that is hydrating helps with the circles. Murad makes a the renewing eye cream that is hydrating and feels like silk. It’s just an amazing eye cream. Use just take a little bit of it and just gently kind of pat it underneath your eyes to keep everything nice an soft. Develop a skin care routine of your own and use it every night if possible. What is your skin care routine? Share your comments below.